Toti is a Canadian artist nationally known for her artworks depicting intimate scenes of everyday life. She captures in her work the subtle rhythm and gesture of family life, the pleasure of city living and the joy of human relationships everywhere. After three Canadian scholarships, Toti completed her study at the prestigious St. Martins in London. 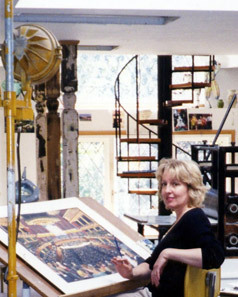 Upon returning to Canada she became reknown as a printmaker. Her etchings of historical buildings and shops produced a series of prints that are today, invaluable. Her love of drawing people inspired artworks of festivals, law courts, ice rinks and sports scenes. She is a master draftsperson and it is easy to share her remarkable journey by observing her many profound and colorful paintings. Toti spent the last four years following the Tour de France. 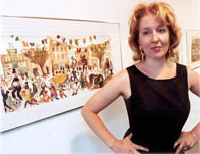 She has recently gained international recognition with her paintings of the Tour. Residing on Vancouver Island with her husband, she now works on commissions and private projects from her studio.